Models in SIMPLIS are typically ASCII text and collected together in model files. These model files can be installed into SIMetrix/SIMPLIS, or the individual model text can be included in the schematic's F11 window. In this topic you will install a subcircuit capacitor model into the library system and verify it works by simulating the design. Models can be primitive models, such as resistors, capacitors etc. or can be subcircuits saved in Model Library Files. Individual models in a library file can be saved as plain ASCII text or as encrypted ASCII text. Model Libraries can be installed in SIMetrix/SIMPLIS with a context menu option in the File View, or by dragging the file from a Windows Explorer window and dropping the file in the SIMetrix/SIMPLIS Main Window. Models can also be saved in the command (F11) window of the schematic. There are two Model Library Catalogs - one for SIMetrix models, and one for SIMPLIS models. The .SIMULATOR control determines which Model Library, SIMetrix or SIMPLIS, to catalog the model. How to install model libraries into SIMetrix/SIMPLIS. How to change which library, SIMetrix or SIMPLIS, the models are available in. How to include a model in the F11 window. On the lower left hand side of the schematic, select U1, the LLC_Modulator_Closed_Loop hierarchical block. 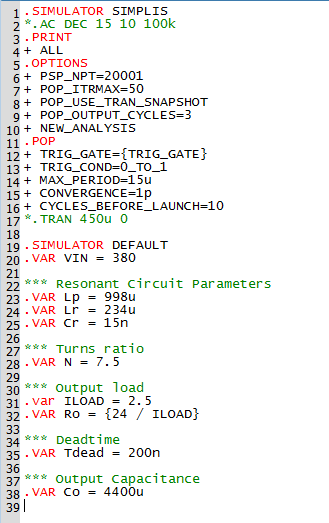 Press Ctrl+E to descend into the LLC_Modulator_Closed_Loop schematic component. On the lower left hand side of the schematic, select X1, the POP Trigger schematic device. Right click and execute the schematic context menu: View Model. Note: The definition of the PERIODIC_OP subcircuit starts on line 1 with the .SUBCKT statement, and ends on line 21 with the .ENDS statement. It is important to note that multiple models can be saved in a single file, hence the term model library file. 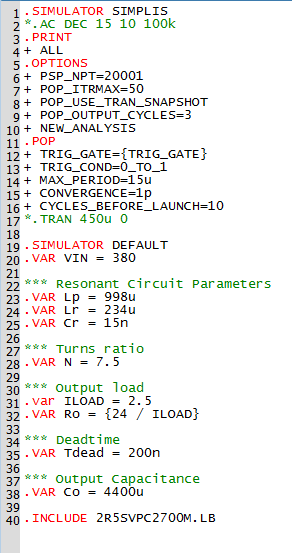 The POP Trigger model is stored in the simplis_param.lb model file which contains several other models including the Electrolytic Capacitor model you viewed in section 3.0.2 What Actual Device is Simulated in SIMPLIS? This dialog shows that two "libraries" are installed. Each library path includes the asterisk wildcard character (*), indicating that all files ending with a .lb extension located in the directory are installed. As these two entries include all built-in model libraries, we strongly suggest you not remove either one. In this exercise you will install a subcircuit capacitor model into the library system. Using the open schematic, 4.2_LLC_Closed_Loop.sxsch, you will change the output capacitor from an ideal primitive capacitor to use this subcircuit capacitor, and note the change in output voltage waveforms. If you have closed the 4.2_LLC_Closed_Loop.sxsch schematic, reopen it. Press Ctrl+Space to open the SIMPLIS Status window. Click on the Clear Messages button to clear the messages. Press F9 to run a baseline simulation using the built-in primitive capacitor. 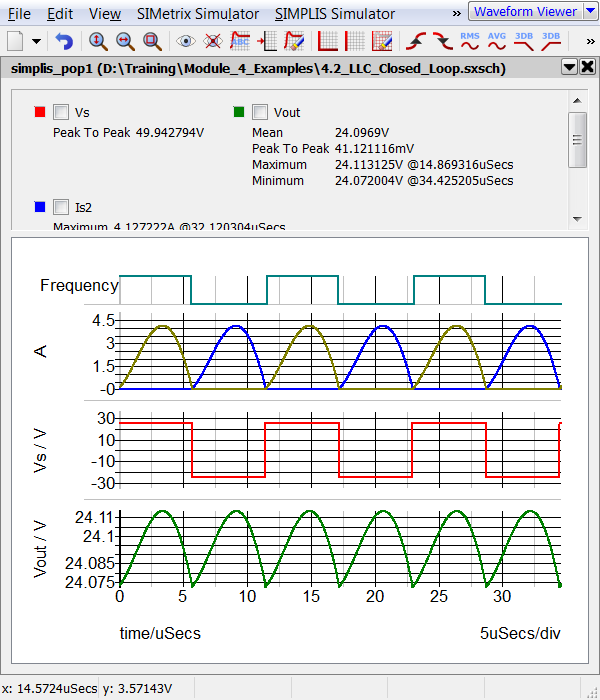 Result: The waveform viewer shows the secondary side waveforms including the output voltage. 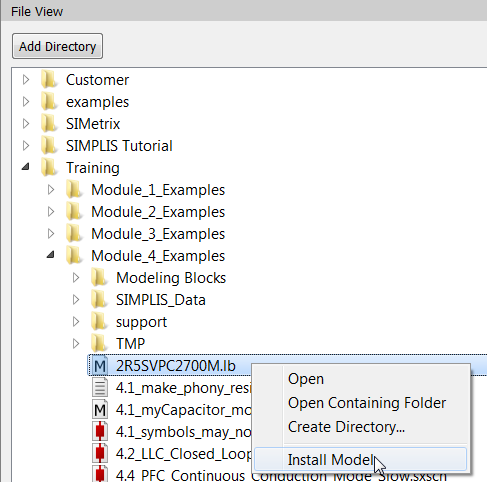 On the file view, open the Module_4_Examples directory and select the 2R5SVPC2700M.lb file and right click to bring up the context menu. Result: The context menu has an option to install the model file. Result: SIMetrix/SIMPLIS installs the model file. The following message is output to the command shell. Result: The Select Libraries dialog opens with your recently installed model library listed. SIMetrix/SIMPLIS installed the model file. This process includes scanning the model file, identifying which models are present, and building an index of these models. The index is used when SIMetrix/SIMPLIS netlists and preprocesses the netlist to speed up the model inclusion process. Exercise #2: Change Schematic to use a Subcircuit Capacitor Model. Delete the output capacitor. 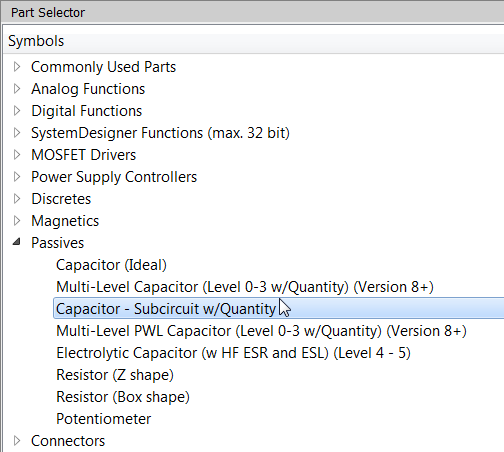 Select the output capacitor Co, and press Delete. From the parts selector, open the Passives category. Select the Capacitor - Subcircuit w/Quantity. Place the capacitor where the output capacitor was located. 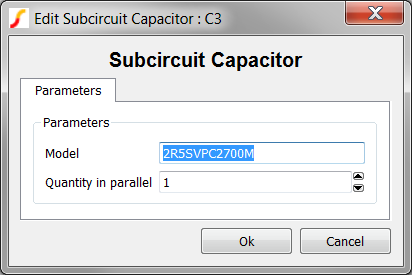 Double click on the output Subcircuit Capacitor and enter the subcircuit name in the dialog: 2R5SVPC2700M. The schematic is now configured to use the subcircuit capacitor defined in a model file. In the next exercise you will attempt to simulate the design. A text file included in the simulation with a .INCLUDE or .INC statement. Installed in the global model library. In this exercise you will attempt to simulate the design using the installed model library file. input, include, or library file(s). What happened? The circuit is properly configured to use a subcircuit model for C3. But the model cannot be found. The reason is the model is installed in the SIMetrix library and not the SIMPLIS one. This common error is caused by the model being installed in the wrong library. 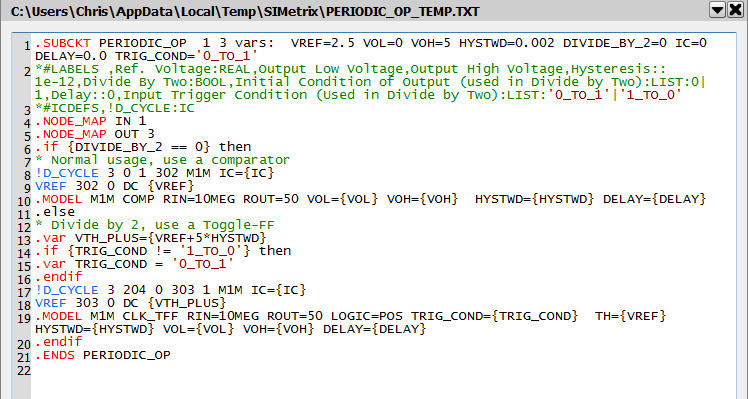 The .SIMULATOR control tells SIMetrix/SIMPLIS to include the model in either the SIMetrix, SIMPLIS or both libraries. Without a .SIMULATOR SIMPLIS statement, models are installed in the SIMetrix library, and therefore cannot be found when the netlist preprocessor searches the SIMPLIS library to include the models. In the next exercise you will add a .SIMULATOR SIMPLIS directive to the model library file. In the File View, double click on the 2R5SVPC2700M.LB model file. Result: The model file opens in the netlist editor. Press Ctrl+S to save the model file. Important: Whenever you modify an installed model library file, you need to rebuild the catalogs. After you have rebuilt the model library catalogs, you are ready to run the simulation. Result: The model is included from the SIMPLIS model library and the simulation completes as expected. 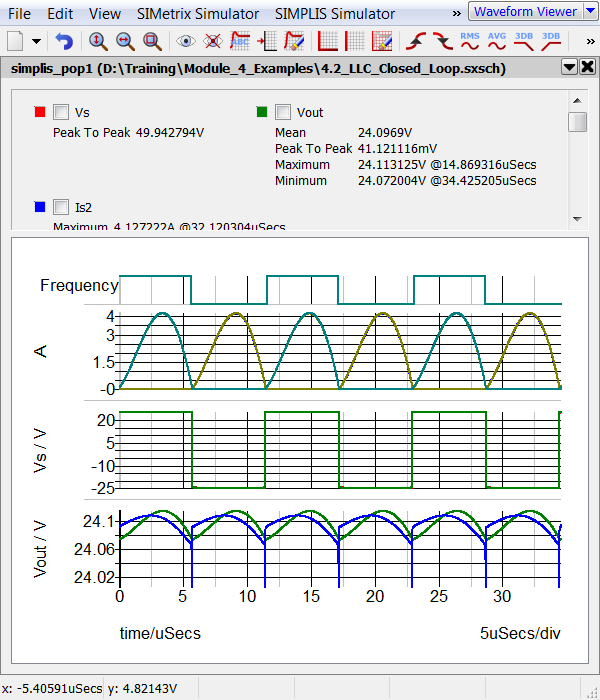 The output voltage for the second simulation has significantly larger ripple due to the additional parasitics introduced by the capacitor ladder network. Models can also be included in the simulation deck by entering the model text in the Command (F11) window. In the next exercise, you will copy the text from the model file and paste it into the schematic's command (F11) window. 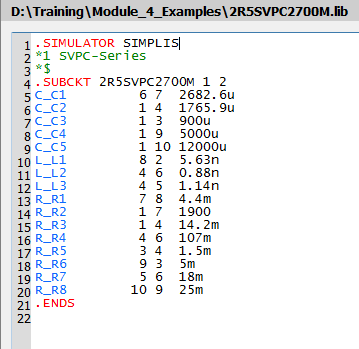 Result: The 2R5SVPC2700M.LB entry is moved to the Available Libraries box. Result: The library is removed, and the catalogs are automatically rebuilt. Navigate to the text editor window. You can always double click on the file in the File View to open or bring the file into focus. Press Ctrl+C to copy the text to the Windows clipboard. Navigate to the SIMetrix/SIMPLIS schematic window where the schematic 4.2_LLC_Closed_Loop.sxsch should be open. Press F11 to open the command (F11) window. Result: The simulation runs as expected. The .INCLUDE statement can be used to include text files in the simulation deck file. The include statement inserts an exact copy of the entire referenced file at the location of the .INCLUDE statement. This makes the .INCLUDE statement an easy way to include the model file in the deck. Delete the entire subcircuit capacitor model starting at the .SUBCKT statement and ending with the .ENDS statement. You can select the entire text and press Delete. Result: The simulation runs exactly as it did in the previous exercise where the model was entered directly in the F11 window. Models can be primitive models, or a subcircuit model saved in Model Library Files. Individual models in a library file can be saved as plain ASCII text or as encrypted ASCII text.